an awesome Collection of yoga pants for ONLY $140 BUCKS! The pictures above are to show you the look and fit only, not color schemes or art themes. To get a better feel for our art, browse our store here or on Etsy. 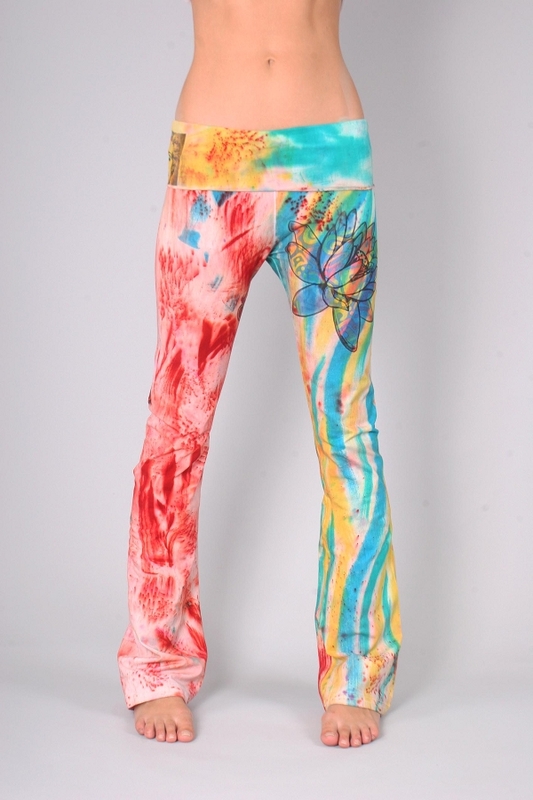 We will use a blank pair of LEGGINGS or FLARE LEG YOGA PANTS as a canvas to whip up something spectacular, unique, and one of a kind, JUST FOR YOU. Why so much less than the rest? Well, not only is it an honor, and they do make perfect gifts, but we wanted more time to play at work. Play to us is painting and embellishing one of a kind yoga pants fresh from the ideas in our head, rather than following any templates. We are rewarding those who totally trust our work, and are always keen to "one offs" and open to artistic surprise. I look forward to creating a collection for you today, and would like to thank you for your support in making us successful independent artists. Just in case you are unsure of our supreme, practically divine skill to create incredible yoga pants, please navigate to our Showroom page to check out previous customer examples on Tristan Christopher’s collection page. Limited run one of a kind yoga bottoms made of an organic cotton/cotton/spandex blend embellished with original art pieces. Fold-Waist Legging not available for this promo.